Hi there music lovers! Here’s the perfect mobile plan for you. Sun Cellular offers an affordable postpaid plan that fits your lifestyle. Subscribe to SUN Postpaid Plan 499 where you can enjoy the Unlimited SUN Calls and Texts, 20 hours Mobile Surfing, 250 Texts to Other Networks, Unlimited Music Streaming and 50% off on Music Downloads via Spinnr PH. 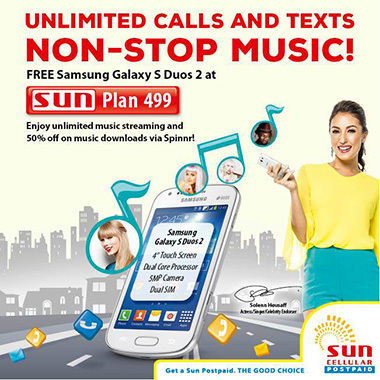 Plus, avail the plan The SUN Shop near you and also get FREE Samsung Galaxy S Duos 2! Visit Sun Cellular Facebook page for more details and latest updates.